Robert was the son of Jewish parents, Leopold and Florentina Kulka, and was raised in the Moravian town of Olomouc. After completing secondary school, he attended a business school until 1909. He began a business in Olomouc and in 1933 he married Elsa Skutezka from the Moravian city of Brno. The couple made their home in Olomouc. 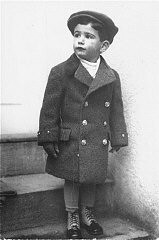 1933-39: The Kulkas' son, Tomas, was born a year and a day after they were married. In 1937 Elsa's father passed away and the Kulkas moved to Brno, where Elsa and her husband took over the family shipping business. Two years later, Germany occupied Bohemia and Moravia and immediately imposed restrictions on the Jewish population. 1940-42: On January 2, 1940, Robert, Elsa, Tomas and Robert's mother-in-law were evicted from their house. That same winter, Robert's brother and sister-in-law managed to immigrate to Palestine [the Yishuv]. But Robert was determined to stay in Brno and save the family business. A year later, Elsa was forced to sell the business to a German for a mere 200 Czechoslovak crowns, or less than $10. On March 31, 1942, Robert and his family were deported to the Theresienstadt ghetto in the western part of Czechoslovakia. On May 9, 1942, Robert was deported to the Ossowa forced-labor camp for Jews. He died within four months of arriving there. He was 52 years old. Photo Three-year old Tomas Kulka stands in front of his house.